I have purchased a Chromascope via German Ebay in March 2003. Not being able to find much information on the web beforehand, it got me curious enough to spend a fair amount of money on it (which some people found ridiculous :) ). Most informations on this page are on the P 135 model. The C.101 model was similar, but a bit simpler. Designed mainly for "home use", it was lacking the video input and -mixing functions. Where does the Chromascope come from? 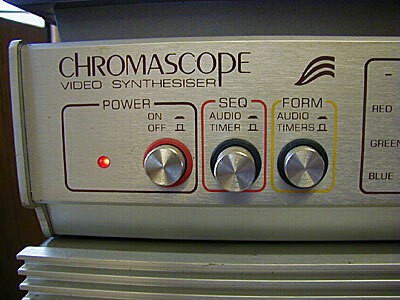 The chromascope video synthesiser was developed by a company named Chromatronics in Harrow, Essex, England. 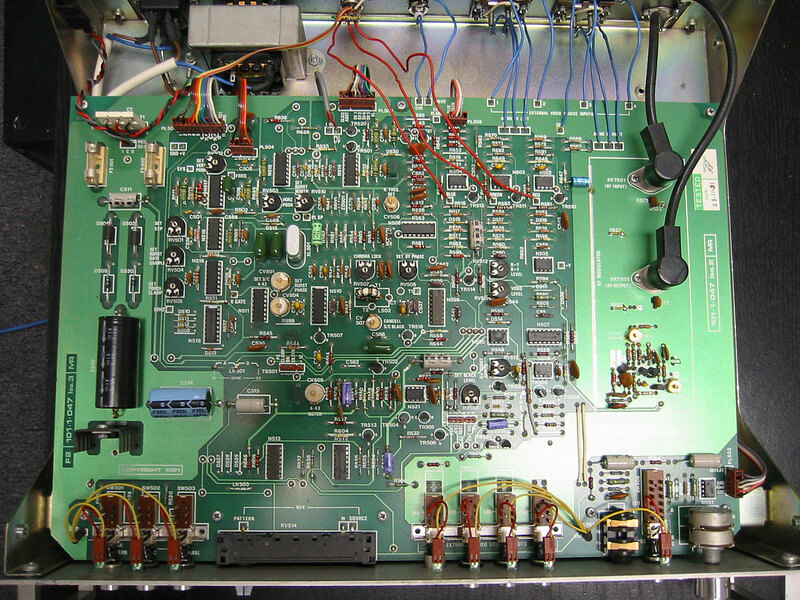 The Copyright printed on the circuit board of the unit described here (Model P135) is 1981. I have no knowledge about the whereabouts of the unit between 1981 and 2003. There are stickers on the board indicating a technical check in 1991. By end of may, 2003 the designer of the Chromascope, Robin Palmer, provided valuable additional information (thank you Robin!). No purchase inquiries to Robin please, the Chromascope is out of production for almost 20 years! "It was me who designed the chromascope back in 1979. 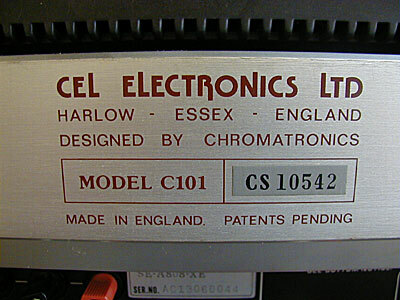 At that time my company, Chromatronics was based in Harlow Essex. However all our sales went through CEL Electronics Ltd; also my company. In 1981, the business moved to saffron Walden Essex, about 30 km south of Cambridge. As far as I can recall the chromascope was in production up until about 1984 when the product line was sold to a company in the USA located in Alabama. I don't think many units were produced in the US. For CEL the chromascope was a highly successful product, selling many units in the UK, Germany and the USA. The total production run was probably about 2000 units. There was a less successful smaller domestic model called the C.101 which is very rare with only 100 ever made. The P135 mainly sold for discotheques and small TV studios and was once used line on-air on a BBC television programme. 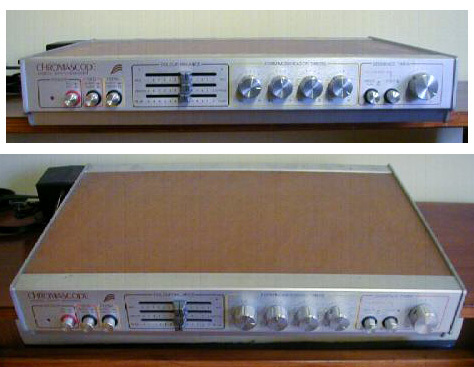 CEL went on to develop digital effects units and standards converters and eventually became part of the Snell and Wilcox Empire in 1992. I left the company two years later to develop other projects and I have long considered possibility of designing a new model chromascope along similar lines to the p 135. I might just do it when I need a rest writing broadcast TV software and my other stuff you can find on www.cel-soft.com"
It's looks, measures and weight are similar to 70's audio amplifiers: buttons, faders, knobs, green LEDs and a brushed aluminium front. The Chromascope creates abstract 2-dimensional coloured patterns in full PAL resolution. The video output (BNC) can be used like any other video source. I've encountered problems when routing the chromascope output through a video mixer or PC video in. The signal looked messed up and out of sync. According to Robin Palmer this may be due to a sync drift which needs adjustment. The workaround is to connect a source with a stable timebase (eg. DV-cam or mixer) to an input and choose the corresponding input button. Even if you don't mix the pattern with the source, the procedure stabilizes the signal. The pictures are influenced by four basic parameters. The "Sequence" is the basic structure of the pattern. 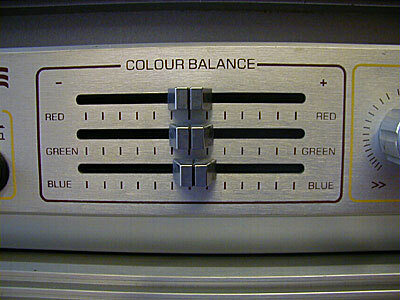 Three "Phase" knobs do modulate color changes and overlaying secondary structures. 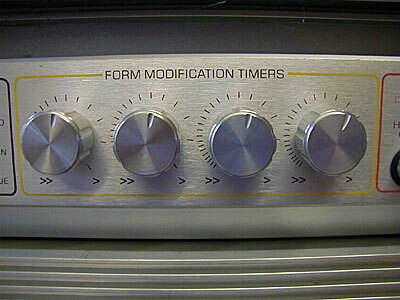 Changes of these parameters can be adjusted on timer knobs, with a range from 1 second to 10 minutes (!). 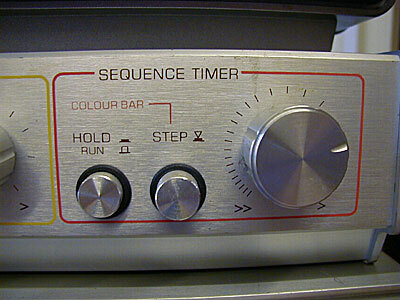 So, if every knob is set to one second, changes occur very fast and things get a bit hectic. If one or more parameters are slowed down, the changes get more subtle and "chilly". One main difference between the Phase and the Sequence functions is that the Phases seem to cycle slowly, while a change in the Sequence is a sometimes hard cut. The sequence is changing according to timer or audio input, but there is no control what the next pattern will look like. For example, maybe you have a pattern of horizontal lines, and the next second a grid of big dots. If you like that pattern, you can push the "Hold" button and override the timer setting. If you don't like it, you can push the "Step" button and jump to the next (random) pattern immediately. The Step and Hold functions work on the Sequence only; the Phase is not influenced. With the Chromascope you may not freely design new patterns, but modify and trigger random processes in a couple of ways. One more function is the Colour Balance with faders for Red, Green and Blue. The effect is obvious, with the possiblity to not only change the chroma, but also the overall brightness (all faders down = very dark picture, all up = very bright). 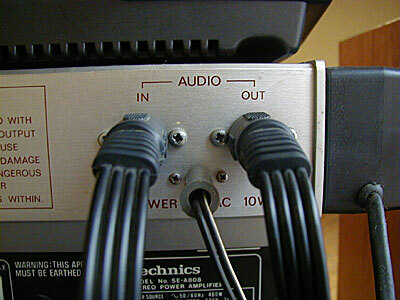 level inputs are for standard line level inputs from a tape/cd player. "). 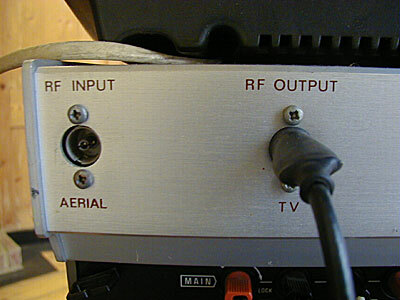 The other input on the front is a standard plug and can be used with microphones or any audio source. The sensitivity level can be adjusted with a knob. Two main buttons make it possible to trigger the changes of Phase or Sequence (or both) via the audio. If activated, they override the timer settings. We'll, i'm no electronics pro. Most of the unit seems to be analogue electronics, maybe there is no digital processing at all. Other people may be able to tell this by a look on the two circuit boards, but not me... Anyhow, even i have been able to fine-tune the unit by using the screws clearly labelled as "Black level" , "Video Level", RGB "Balance" etc. (When i got it the picture was a bit purple and the external video had some horizontal offset). The layout on the board is beautiully clear and its easy to get an basic idea of some functions. Thank you guys who did it! It's fun! But to be honest, i have had little knowledge for what market this product was developed. The use in a club/disco context seemed obvious - but in the early 1980s psychedelic patterns and colours were not much asked for and beamers were huge, dim, horribly expensive monsters... Maybe some very rich people bought one and got high in their penthouses watching colourized TV...? Robin Palmer cleared things a bit up with his comment (see above). Today this unit may seem obsolete, because software can do the "same" and more - but playing around with dedicated hardware and lots of controls is still thrilling. 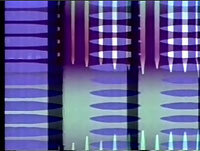 The Chromascope cycles though colour and form modulations, the basic structure (sequence) changes with a hard cut. From 28 sec. 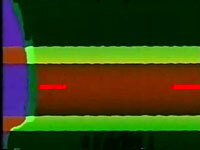 on the videoeffect-buttons are used, not to much effect here (they posterize/colourize).